CSE Water Team organised a three dayIntegrated Orientation Training Programmefor Municipal Functionaries of Delhi. 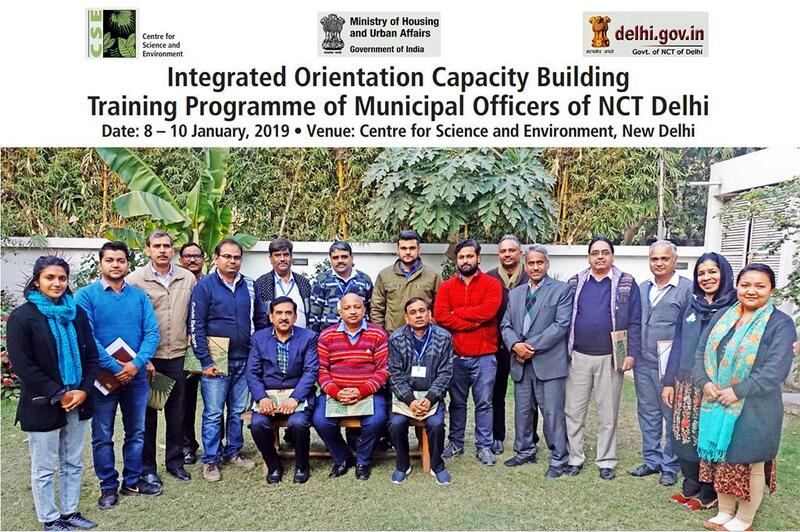 Officials from various municipal cooperations’ (SDMC, NDMC, EDMC etc) and Delhi Jal Board participated in the training. On first day, Rudresh Sugam, Senior Programme Manager, CSEwelcomed the participants and gave an overview about CSE’s work at national and global platform. He also talked about the development issues caused due to increasingurbanisation and discussed the strategies to be opted in order to promote sustainable urban growth throughorganised planning, development and governance.Further Dr MahreenMatto, Programme Manager, CSE discussed in detail about the Amrut programme- the thrust areas under Amrut, Reforms, Service Level Benchmarks (SLB), Service Level Improvement Plan (SLIP), State Annual Action Plan (SAAP), Funding Pattern, Capacity Building etc. Later, Rahul Mankotia, ProgrammeManager, CSE briefed participants about the different missions/schemes of Ministry of Housing and Urban affairs (MoHUA) and their convergence.During second half of the day, participants were taken for a tour to the successfully implemented Rainwater Harvesting System in Nizammudin East Colony. The participants interacted with the implementer to understand the challenges and opportunities of the implemented project. Thesecond day of the training started with the session on sanitation wereBhitush Luthra, Programme Manager, CSE discussed about sanitation scenario of India and how each city can improve its sanitation condition by looking at theFaecal Sludge and septage management (FSSM) as around 60% of India is dependent on Onsite sanitation. The session was supported with documentary films on FSSM. This detailed session was followed by a session on Livability Index. The session introduced various criteria’s and indicators involved in making a city livable and sustainable. The last session of the day talked about solid waste management where Ms. Sonia Henam, Programme Manager, CSE discussed about the waste management challenges and presented the case study on Muzaffarpur, Bihar were involving various stakeholders helped in implementation of waste management practices. The session was followed by documentaries on cities implementing solid waste management in India. Further tour tthe compositing unit of CSE was done were the solid waste of the campus is being segregated and treated. Day three of the training started with Ms. Chhavi Sharda, ProgrammeMangaer, CSE session on the understanding of the decentralized approach of wastewater treatment including reuse, which was supported by case studies from various parts of India to get insight of the best management practices. The session was followed by showcasing the decentralized wastewater treatment system (DWWTs) implemented in the campus. The DWWTs treats the grey and black water of the campus and the treated water is used for horticulture purpose. Further, participants were given an insight on air pollution and transportation, where, Ms. Ananya Sen, Programme Manager, CSE, discussed about the sustainable mode of transport in urban cities. She emphasized on the use of non-motorized transport like public transport, cycles, and also talked about the implementation of stringent policies to strengthen the initiative. She also talked about air quality - PM 2.5 and PM 10 and how it is affecting the health of citizens and what measure are being taken to resolve the issue. The last session was taken by MsShivaliJainer, ProgrammeManager, CSE on understanding the importance of green spaces in flood mitigation and ground water recharge. The implementation strategies of Sustainable Urban Drainage system (SuDS) was supported by documentary on ‘Design That HoldWater’. At the end ofday, Dr. Matto, CSE moderated the feedback session, where participants expressed their perception about the quality and key learnings from the training programme. They mentioned that through the training they have got a more holistic picture of how all the sectors like water, sewerage, solid waste, etc are interconnected.They emphasized on conducting more such programmes. Training was conducted in a very engagingand cooperative environment. All the trainers were well informed.Overall a great and learning experience. Thanks a lot for the training. This should not be one-timeprogramme, we should be called frequently for interaction & learning process as such institutes are expected to provide solutions to problems. A practical approach is required to implement on ground. Participants should come from all fields not only from engineering background. This will help in more interaction and knowledge sharing.